Erin is a motorcycle expert having been involved with motorcycles as both a passion and profession. Erin is a two-time national champion (2003 & 2006) with the American Motorcyclist Association. He has been riding motorcycles since he was 9 years old and has over 40 years of experience with the operation, design and maintenance of both on and off-road motorcycles. He has developed his motorcycle expert credentials by education and experience. Erin has a Bachelor of Science in Mechanical Engineering. As a Project Engineer for the Automotive Testing Laboratories, he completed testing for motorcycle and automotive OEM’s dealing with vehicles, engines, emissions, vehicle components, and alternative fuels. For the Transportation Research Center, he managed motorcycle and automotive programs in the areas of emissions, performance and durability. Erin has spent years in both chassis and engine dyno test cells completing research on motorcycles, ATVs and light duty vehicles. 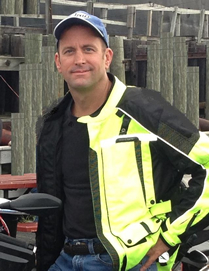 His motorcycle expert work and vehicle expert work has included incident investigations coast-to-coast in the United States and Canada. This work has spanned the range from initial inspections through trial testimony. He has been found qualified by state and federal courts to provide testimony as a mechanical engineer, motorcycle expert, vehicle expert and crash reconstruction expert. Erin has over 20 years of professional automotive engineering experience, as well as over 40 years experience with motorcycles, including operation, maintenance/repair and design. Erin’s experience includes a background completing research at an automotive proving grounds facility, working for both Automotive Testing Laboratories, Inc. and Transportation Research Center, Inc. in East Liberty, Ohio. Erin completed emissions and powertrain-related research programs for motorcycle manufacturers, automobile manufacturers and agencies such as the American Petroleum Institute (API) and the United States Environmental Protection Agency (US EPA). This work included FMVSS testing and related regulatory compliance testing. He has made technical presentations to the American Motorcyclist Association (AMA) and the Coordinating Research Council (CRC) regarding motorcycles. As a Project Engineer for the Automotive Testing Laboratories, he completed testing for motorcycle and automotive OEM’s dealing with vehicles, engines, emissions, vehicle components, and alternative fuels. For the Transportation Research Center, he managed motorcycle and automotive programs in the areas of emissions, performance and durability. Erin is a member of the Society of Automotive Engineers, the American Motorcyclist Association, Western Eastern Roadracing Association and the American Historic Racing Motorcycle Association.